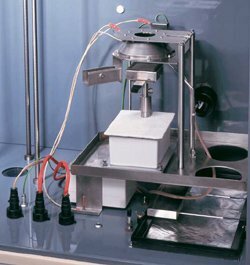 This widely-used test instrument measures the specific optical density of smoke generated by materials when an essentially flat specimen, up to 25 mm thick, is exposed vertically to a radiant heat source of 25 kW/m2, in a closed chamber, with or without the use of a pilot flame. Tests to ASTM E 662, ASTM F 814, and the FAA Materials Aircraft Materials Fire Test Handbook. Cabinet designed with a standard 19″ rack, for simple addition of gas analysers and chart recorder and other control units. 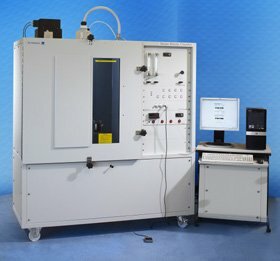 The software package is designed as a data acquisition, computer control and presentation package for the FTT Smoke Density Chamber (SDC). The software allows for a more efficient use of the instrument with reduced user interaction with the instrument controls during testing, leading to a larger daily throughput of testing and enhanced quality data presentation. The software interfaces with the SDC via a multi-channel A/D converter. An A/D board is fitted inside a PC and this interfaces with the SDC via a 37 interface. The user interface is a Microsoft Windows based system with push button actions and standard Windows data entry fields, drop down selectors, check boxes and switches. A general Status window will display the output from the transducers on the SDC. This panel is intended to be used for diagnostic purposes and for monitoring the system when a dummy specimen is in position. The furnace calibration is performed using the radiometer and monitoring the output. The SmokeBox software displays the output from the radiometer and converts this signal into a flux from the calibration data for the radiometer, which is entered as part of the configuration. A routine for determining the optical density value of the range-extension filter in the photometric system is described in the standard. 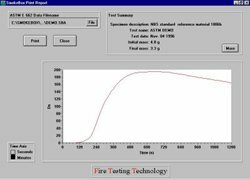 The SmokeBox software guides the user through this routine and then calculates the optical density. This value is stored and used to correct data as required in real time during a test. The software saves the data to a file automatically named with the date and test number. This is to prevent any valuable data being overwritten. The user is, however, able to use their own file names if this is preferred. Information about the test and the specimen material is entered prior to a test run. This information is stored to disk, along with the numerical data generated during the test. Real time data is displayed on the VDU during a test. The information is displayed in both graphical and textual form. The graphical form will be an autoscaling graph with time on the x–axis and the transmission (%) on the primary y–axis and the specific optical density on the secondary y–axis. On completion of the test, the clear beam transmission is recorded. This is used to correct the data for deposits on the optical system. All data is stored in ASCII text files which can be imported into any spreadsheet package for further analysis. SmokeBox will control the range settings and filter position during a test via the A/D system. This ensures that operator errors are kept to a minimum. A report may be produced after the test. This report includes a graph of the specific optical density against time, tabulated transmission and specific optical density data at 30 second intervals, specimen information and additional parameters required by the specific standards, e.g. a mass loss graph for the ISO 5659 test method. The report may be printed on any device with a Windows driver.